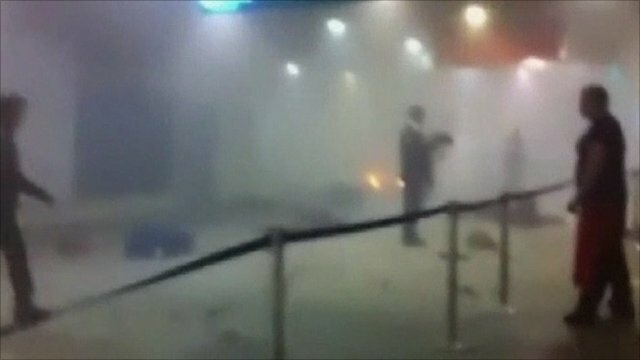 An explosion has ripped through Moscow's Domodedovo airport - the busiest in the Russian capital, killing at least 35 people. Some 170 people were injured in the blast, which reports suggest was the work of a suicide bomber. 0007: That concludes our live coverage of the attacks in Moscow. Scores of people have been injured and 35 people are dead. President Dmitry Medvedev has vowed to track down and punish those behind the attack and has ordered tighter security at Russian transport hubs. No group has claimed responsibility. 2357: Russia's National Anti-Terrorist Committee says that security arrangements at Domodedovo were inadequate. "Otherwise nothing would have happened," spokesman Nikolai Sintsov tells Russian media. There were not enough scanners and some of those that had been installed did not work. 2345: Islamist militants from the North Caucasus were probably behind the attack, security experts tell Russian business newspaper Kommersant. The attack may have been an act of revenge for recent anti-militant operations, including the killing of Pakhrudin Gadzhiyev in Dagestan last Friday. Gadzhiyev was suspected of organising suicide attacks last year, the paper notes. 2326: Most of the people in the arrivals area were awaiting passengers from a London flight, Moskovsky Komsomolets, a popular Moscow daily, reports under the headline "Terrorists meet passengers". Other people were meeting flights from Duesseldorf and Odessa. 2313: UK Foreign Secretary William Hague: "I condemn the mindless act of terrorism that took place this afternoon at Moscow's Domodedovo airport. Such acts can have no justification and serve no purpose." 2252: Canada "strongly condemns" the bomb attack, Prime Minister Stephen Harper says. "The use of violence against innocent people must never be tolerated and we condemn those responsible for this horrible act." 2224: There seems to be some confusion over the official number of injured. The emergencies ministry has just raised its total to 180, saying 86 are in hospital, Interfax reports. 2151: Health Minister Golikova says that 128 people were injured in the blast, Interfax reports. Of these, 93 remained in hospital as of 2000 GMT, with 41 of them in a grave condition. Confirming 35 deaths, she says 31 died at the scene of the blast, three died in hospital and one died on the way to hospital. 2142: Emergency services began removing bodies from the airport after 1930, Ria-Novosti reports. It was expected to take about three hours for all of the dead to be placed in Moscow morgues. 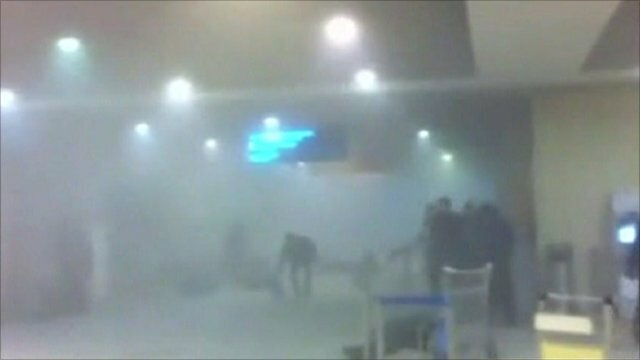 2125: The BBC's Daniel Sandford at Domodedovo Moscow says: Eyewitnesses say the explosion happened in the area where friends, relatives and drivers were waiting for passengers to come through customs. There security was much less tight, as it is in many other airports. 2050: Russian investigators describe the bomb used: "An improvised explosive device packed with shrapnel, pieces of chopped wire", equivalent to between two and five kilos (4 and 11 lb) of TNT. 2044: Two Britons were killed in the blast, Russian investigators confirm. 2030: Amid disgust over reports of Moscow taxi-drivers inflating fares to and from the airport, volunteer drivers have been offering their services free of charge, posting their mobile phone numbers on Twitter. Some have been offering a free bed for the night to people affected by the explosion. 2000: British Prime Minister David Cameron expressed his condolences to President Medvedev in a phone call, making "clear that the people of Britain stood with the people of Russia in the face of these events", Downing Street reports. "We should never allow the terrorists to win," Mr Cameron was quoted as saying. 1936: Casualty update: 170 people were injured, of whom 76 were being treated in hospital as of 1900 GMT. The other 94 received medical aid at the scene. Source: Russian emergencies ministry, quoted by Interfax. 1934: The moment of the blast was captured by at least one CCTV camera, a security source at Domodedovo tells Interfax. 1924:The BBC's Daniel Sandford at Domodedovo Moscow says: Half of the airport is pretty much back to normal. People are still checking in for flights. There is increased security at the entrance. But the other half is completely sealed off. It is a crime scene. There are still fire engines and ambulances around. 1914: Russia's secret services had been aware that an attack was in the offing at one of Moscow's airports, a security source tells Ria Novosti news agency. They had been seeking three suspects, who are now believed to have driven the bomber to the airport's long-term car park. 1906: The rouble weakened in inter-bank trade after the blast, giving up gains made earlier on Monday, Reuters reports. 1900: Alexander from Yekaterinburg e-mails:There used to be metal detectors at entrances to the airport, now they are no longer used. The police are idle and corrupt. What can we do? Probably do as Israelis do - avoid places where lots of people gather. The Russian Caucasus is out of control. 1858: Leg wounds among the injured suggest the bomber may have detonated explosives placed on the ground, the Russian news website lenta.ru reports. 1849: Israeli Prime Minister Benjamin Netanyahu: "I want to send... on the behalf of the... people of Israel, our condolences to the government, the people in Russia, to the bereaved families. Terrorism is global and the response to terror must be global." 1838: "The nature of terror is that none of us, none of the countries in this world, are free from this threat, and none of us could ensure 100% security level," Putin spokesman Dmitry Peskov tells the BBC. 1835: The UK's Foreign Office tell the BBC they are looking into reports that a British citizen is among the dead at the airport. The embassy have a team at the airport but cannot confirm the report. 1822: In a televised briefing on state TV channel Rossiya 1, Prime Minister Vladimir Putin tells Social Development Minister Tatyana Golikova: "It is necessary to prepare a draft government decree on providing financial aid to the families of those killed. I ask you and your deputies to go to the clinics, on the spot, to see how work is being organised to help the victims." 1819: Interfax reports at least one British person among several foreigners killed. 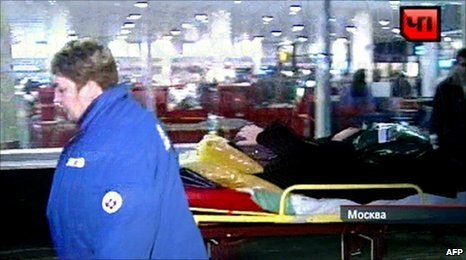 1807: The BBC website now has a picture gallery of the tragic events at Domodedovo airport. 1759: European Commission President Manuel Barroso says: "It was with shock and great sadness that I heard about the terrorist attack at the Domodedovo airport outside Moscow this afternoon. I strongly condemn this cowardly terrorist attack. I send my heartfelt condolences to the government and to the people of the Russian Federation, and in particular to the families and the loved ones of the victims." 1755: British officials say there are no confirmed UK casualties, but say they are "urgently investigating" after witnesses said a British Airways flight had just landed before the explosion. 1740: Russian affairs analyst Andrei Ostalski tells BBC World Service: "The attack was so professionally engineered, it was done in such a brutally efficient way there are not too many groups in Russia that have this kind of practical experience of setting up such devices. So of course everybody is thinking about Chechen groups and insurgents who have been trained to do that kind of thing." 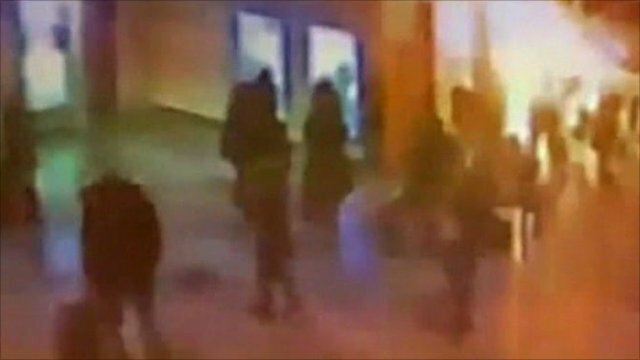 1737: According to eyewitnesses quoted by Russian TV's Vesti news programme, the bomber shouted "I'll kill you all" before detonating his explosives. 1732: Rumours are circulating that transport chaos caused by the blast has caused unscrupulous taxi drivers to hike their prices. Yevgeny from St Petersburg e-emails BBC Russian: I am shocked by taxi drivers' reaction. They are asking for 10,000-20,000 roubles (hundreds of dollars) for a ride. How can they do this when it is their countrymen who have suffered? 1722: Interfax quotes unnamed security sources as saying the head of the suspected bomber has been found: "We have found the head of a man of Arab appearance who is about 30 to 35 years old. He presumably set off the explosive device." 1715: First reaction from US government: President Barack Obama condemns "outrageous act of terrorism", according to the Associated Press. 1709: More detail on where the explosion happened, airport spokeswoman Yelena Galanova telling Interfax: "The explosion occurred in the international arrivals hall in a public area, to which people who are not passengers have free access." 1703: British businessman Ben tells the BBC: "I was in the queue at passport control when I heard a big explosion. I wasn't sure if it was external work, or an explosion inside the building. It shook the ceiling, there was dust coming down as smoke was coming from inside the baggage hall. The dust was everywhere - you would think it's time to clean your glasses even if you don't wear glasses." 1655: Aviation expert Chris Yates backs the theory that suicide attacker was responsible for the attack, telling the BBC: "Quite an amount of shrapnel has been found in the arrivals hall - ball bearings and other things that could be packed into a suicide belt. We could be talking about a walk-in suicide attacker walking in and blowing themselves up at that critical moment." 1652: BBC security correspondent Gordon Corera says: Militant groups fighting in the Caucasus know how important the perception that the president and prime minister provide a secure society is. To undermine that is a key aspect of their aims. 1645: The explosion is believed to have happened in the baggage collection area, and aviation expert Philip Baum says such an incident was predictable, adding: "We spend so much time looking at passenger security checks before they get on board, that unfortunately some other areas are exposed." 1637: Both officials and analysts are saying the explosion is likely to have been a bomb attack. Paul Rogers from the UK's Bradford University tells Reuters: "As to the likely suspects, one would have to say Caucasus, mostly likely Chechen-connected." 1634: Airport spokeswoman says 35 people have now died as a result of the explosion. 1632: German Foreign Minister Guido Westerwelle sends his deepest sympathies to to the victims, adding: "I condemn this dreadful and bloody attack in the strongest possible terms. Nothing can justify this barbaric act." 1628: British traveller Mark Green arrived at the airport on a flight from London shortly before the incident and described hearing an "almighty explosion" as he left the arrivals area. 1627: Ria news agency reports security services were warned in advance about a possible terrorist act: "Personnel were searching for three suspects but they managed to get on to the territory of the airport unhindered, watch the explosion carried out by their accomplice and leave the airport." 1610: More detail coming through about the condition of survivors: Ria news agency reports 51 people hospitalised, of whom 35 are in a serious condition. 1607: The BBC's Yuri Maloveryan at Domodedovo says: Several dozen ambulances there, entrances to arrivals hall and hall at opposite end of airport closed, but entrances in the middle of the airport are open, all passengers being checked with metal detectors. 1602: Nato chief Anders Fogh Rasmussen offers "solidarity" to Russia, reports AFP news agency. 1559: President Dmitry Medvedev delays his departure to the World Economic Forum in Davos, Switzerland. 1554: Kostik e-mails BBC Russian : I am not surprised it happens. Police are more concerned about attacking opposition demonstrations in Moscow than security of its people. 1552: President Dmitry Medvedev tells officials in a televised briefing: "From the preliminary information we have, it was a terror attack." 1532: Vnukovo airport spokeswoman tells Interfax the airport is receiving flights diverted from Domodedovo. 1528:The BBC's Steve Rosenberg in Moscow says: Russia's chief investigator has now classified the blast as a terrorist attack. Dozens of ambulances have been dispatched to the scene and following the blast, police have stepped up security across the Russian capital, particularly at other Moscow airports. 1522: BBC Russian is also reporting the day's dramatic events on a live text page in Russian. 1521: British Airways says in a statement: "We are aware of the incident at Moscow's Domodedovo airport and are speaking to our teams at the airport to establish further information." 1515: Russian President Dmitry Medvedev says those responsible for the explosion will be tracked down and punished, according to comments reported by Reuters news agency. 1510: Russian news agency Interfax reports the explosion was caused by a bomb with 7kg of TNT. Police searching for three male suspects. 1508: Eyewitness Mark Green, who had just arrived in Moscow when the explosion happened, tells the BBC: "We were walking out through the exit of the arrivals hall towards the car, and there was this almighty explosion, a huge bang, we didn't know it was an explosion at the time, and my colleague and I looked at each other and said, Christ that sounds like a car bomb or something, because the noise was, literally, it shook you." 1503: Moscow police are on high alert and are looking for suspicious items on the transport system, 90 minutes after the airport explosion.